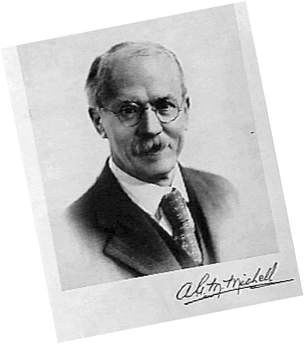 It was in 1905, nineteen years after Osborne Reynolds had considered the lubrication of plane surfaces, that Anthony George Malden (AGM) Michell, found a solution to Reynolds’ equation, which took account of side leakage. In the same year, AGM Michell patented a type of bearing in which the load was carried upon hydrodynamic oil films generated by a series of pivoting white metal (or babbitt) faced pads. The principle was applied to both thrust and journal bearings and is now universally known as the Michell Bearing. As the inventor of the hydrodynamic bearing over 100 years ago, Michell Bearings has spent the last century developing its products to meet the changing needs of industry. Michell Bearings was established in Newcastle upon Tyne, United Kingdom, in 1920. Principal shareholders at that time were Vickers, Fairfield Rowan, John Brown Engineering and Cammel Laird. On 1 January 1969, Vickers purchased 100% of the shareholding; the integration being fully completed by 1 January 1971. During 1994, Michell Bearings set up a joint venture company in India to manufacture bearings for the Indian market. Michell Bearings India, located in Bangalore, commenced production in 1995. Following the acquisition of Vickers in 1999, Michell Bearings became part of a grouping of businesses within Rolls-Royce Power Engineering plc. In November 2015, Michell Bearings was acquired by British Engines and Malpani Holdings, to become part of the established British Engines Group. As the inventor of the hydrodynamic bearing over 100 years ago, Michell Bearings has spent the last century developing its products to meet the changing needs of industry. Now, state of the art technology, decades of sector experience and unrivalled quality systems mean that Michell Bearings has a large loyal customer base and a reputation as a leading light in bearing design and manufacture.